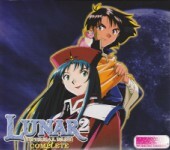 Eternal Blue Complete had mostly the same soundtrack as the original Eternal Blue, although most tracks were remastered (this is unlike SSS, which had an entirely new soundtrack).The US version also came with a soundtrack, which included higher-quality versions of many of the themes in the game. There is unfortunately no easy way to get audio directly from the game, but the soundtrack does contain some of the best tracks. You should be sure to check out the soundtracks section for more, and the Eternal Blue - Music section for tracks from the original. Most music tracks in SSS were composed by Noriyuki Iwadare with additional sound work by Isao Mizoguchi. The vocal tracks were sung by Chisa Yokoyama for the Japanese version, and by Jennifer Stigile for the US version.